Is India en route to becoming an innovative nation? CEOs at BTâ€™s lunch meet in Bangalore ponder whether India has it in her to make a global mark in innovative products. Transforming India (Standing, from left) Kallol Borah, Srini Rajam, Ravi Gururaj, BT Managing Editor Josey Puliyenthuruthel, N.R.K. Raman, The Taj West Endâ€™s (Seated): Exfinityâ€™s, Poornima Shenoy, Shoaib Ahmed, Subhash Dhar.Photo: Nilotpal Baruah. Long after the salad of artichoke hearts, the parma ham sandwiches, the mushroom and chives crepes had been consumed, fireworks from Business Today's round table in Bangalore were still resonating - on Facebook. At the lunch, nine CEOs and investors had discussed whether India could become a product nation - globally renowned for its innovative products. Soon afterwards, panellist Ravi Gururaj, Product Chair at NASSCOM, in his Facebook post on July 22, said: "Invigorating CEO lunch round table hosted by Business Today at the lovely Taj West End. Optimism all round and we reached the consensus that it's only a matter of time before the goal of transforming India into an "Innovative Nation" is achieved." This didn't go down too well with Sharad Sharma, Founder at product think tank iSPIRT. Although he was not part of the debate, iSPIRT was represented by Shoaib Ahmed, President at Tally Solutions, and Shekhar Kirani, Partner at Accel. Sharma took on Gururaj on Facebook. "India is sliding on every Innovation Index and has fallen 10 places, yes 10 places, just last year. It is the lowest amongst the BRICS. This relentless cheerleading takes us away from meaningful conversations about what's wrong and how to fix the ecosystem. Let's be more self-critical about our ecosystem so we can actually make it better." Gururaj soon clarified. "Plenty of deep thought and meaningful conversations went into the lunch meeting discussion. Not sure on what basis you believe it was a cheerleading session. Speaking for myself, I was certainly very critical about our present situation - the flight of talent/companies due to a poor business and regulatory environment, hurdles that prevent capital flowing into our early stage companies, lack of development of domestic market and lack of ability of smaller companies to sell to PSUS/government, and a ton of smaller but important friction points like the inability to effect recurring payments on credit cards, double taxation etc. I even lamented the fact that I have personally not felt compelled to use on a daily basis a single "Made in India" mobile app on my phone." Gururaj went on to summarise the discussion. "Nobody was cheering and applauding the current situation, nobody was rejoicing on a job already well done, nobody was claiming victory in any manner. We were only optimistic about the possibilities and opportunities that lie ahead to turn India into a truly innovative nation ... not just in the software products arena but across the board in many areas of technology." Both the product veterans - Gururaj and Sharma - agreed to take their debate offline, over multiple beers. But not before Sharma posted: "I too wish for "fantastic" results, but believe that they will come from real hard work as ecosystem builders. Merely getting in front of the mini wave that we are witnessing right now is fun but not the way to get end goal." Sharma's point about the "mini wave" was discussed too - the first part of the round table was mostly about what had changed in the Indian product world between a decade ago and now. Replying to this question from moderator Josey Puliyenthuruthel, Managing Editor, BT, participants said disruptive product companies could well mushroom in India over the next decade as now it takes less capital to start a company, while there is more capital available for start-ups. Also, technology has been democratised - what is available to Google, for instance, is also available to Indian firms such as InMobi. V. Balakrishnan, Founder and Chairman at Exfinity, a private equity fund, and former board member at Infosys, said Bangalore could become a second Silicon Valley. 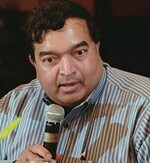 "There are 1,000 new companies (start-ups) in Bangalore every year," he said. "The city has a lot of experienced professionals from the IT services industry, who now want to work with product companies. Fresh graduates from colleges and young professionals are also willing to take risks doing start-ups." N.R.K. Raman, former MD and CEO at Oracle Financial Services Software and now an investor, said the barriers product companies faced a decade ago had vanished. Unlike in previous years, investors are no longer enamoured by services businesses. "They are willing to fund product companies and stay invested for a longer time," he said. Accel's Kirani said India had missed the boat in creating telecom products for the domestic market. There was also little happening in aerospace and biotech. But he was hopeful of software products. The world is buying; companies globally are replacing old software with new and that presents an opportunity for Indian firms. As Gururaj pointed out in his response to Sharma, the panellists engaged in some introspection too, and pointed to challenges that could stunt the growth of 'Made in India' products. Kirani even added that people could well lose hope in Indian software products, considering the country has not yet built any big-ticket products - the ones priced at $1 million or above. Ahmed of Tally Solutions said there was urgent need to deal with and modify the nation's services mindset. 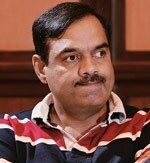 In services companies, said Subhash Dhar, Founder at EnterpriseNube, the process is dictated by the customer. "It is quite the reverse in product firms." Dhar sparked a debate on the role the domestic market should play by saying thinking small would be a big mistake. Start-ups should think global because it is a "flat world". 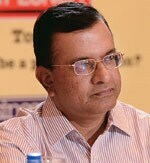 Indian product firms needed to think in terms of dominating the globe, rather than seek protection in the Indian market. Srini Rajam, Founder at Ittiam Systems, said the biggest challenge before Indian companies was marketing - understanding trends and defining products. "What to do is more challenging than how to do." Poornima Shenoy, Founder and CEO at Latitude Edutech, pointed to the problems in developing more product professionals. Colleges, beyond the top league, were not even aware of product companies. Students, therefore, were not seeing and hearing enough success stories. Kallol Borah, CEO at Lukup Media, said that while there was a lot of money in the product ecosystem now, it would be wrong to be motivated by valuations. "Focus on the product and get it right," was his advice. The debate remained intense to the end. 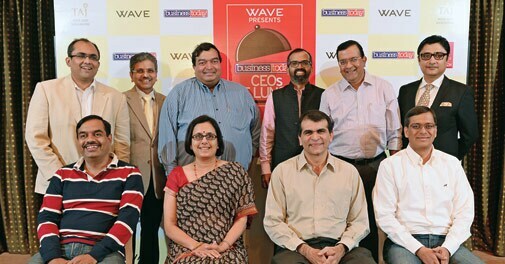 The lunch was sponsored by Wave and hosted by The Taj West End.